Model by Thomas Hartwig, Bremen Germany. The VK4501(P) was the Porsche entry into the competition which would ultimately result in the Tiger I. Based on the experience gained with the VK3001(P), the new design represented essentially a "scaled up" vehicle. The suspension of the new vehicle consisted of six pairs of rubber-tired road wheels on each side. The rear drive sprocket powered the tracks. Power was provided by two V-10 air-cooled engines which, in turn, drove electric generators. These electric generators provided the electric current to power two electric engines (one for each drive sprocket). The final result was a hull and superstructure which was nearly 50% occupied by power-train. The reason for this arrangement was to improve the overall power transfer efficiency relative to a conventional drive sprocket and transmission. Unfortunately, the engines themselves proved unreliable. Porsche began production of the vehicle immediately after the completion of the prototype in April 1942. Delivery was scheduled to begin that July. Problems with the suspension and petrol motors brought production to a halt in August, and becuase these problems could not be solved, Nibelungenwerke was ordered to stop all production of the VK4501(P) in October. 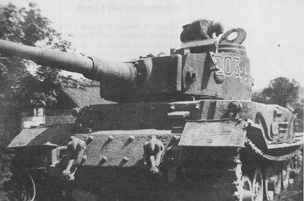 The turret from the Tiger (P) was modified slightly and used in the production Tiger I, designed by Henschel. The hull of the Tiger (P) was modified to run directly using two Maybach HL120TRM to create the Elefant tank destroyer (previously known as Ferdinand). 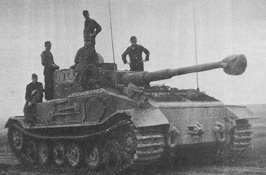 It appears as if one example of the Tiger (P) was actually used in combat as a command vehicle by Schw. Pz. J�g. Abt. 653. This unit was equipped with the Elefant tank destroyer. The two views below are of this vehicle. The vehicle number was 003 and was commanded by hauptmann Hanns Wegelin. Not the additional radio antennae on the Tiger (P). Below is a section of the tactical organization chart of Schw. Pz. J�g. Abt. 653 dated June 1, 1944 showing the other unusual vehicles feilded by the headquarters company of this unit included the Panther with Panzer IV turret and the 2cm Flakveirling auf Fahrgestell T34. This unit was later re-equipped with Jagdtigers. The remaining elefants were given to Schw. Pzjg. Kompanie 614. Four elefants remained in that unit's last combat near Zossen south of Berlin on April 22, 1945. I have been unable to find records of the fate of the Tiger (P) and other vehicles.